The Energy System gas boiler is a condensing, wall mounted unit which has been designed and manufactured by Glow-worm in the UK. As a System boiler directly heats your central heating system and hot water for a storage cylinder. Most of the important parts of the hot water and heating system such as the pump and expansion vessel are built-in on a system boiler. This makes it quicker and cleaner to install and results in a faster response to demand for heating and hot water. You also don’t need to have a feed and expansion tank in the loft. This is a highly efficient unit operating at 89.3% with an ErP rating of B. The output rating of 18kW makes the unit perfect for homes with a lesser demand for heating and hot water e.g homes with just one bathroom. 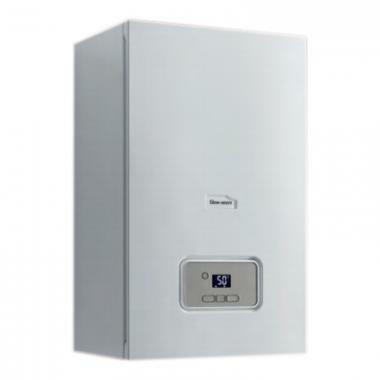 This boiler also available in a wide range of other outputs such as 12kW, 15kW, 25kW and 30kW. This means you should be able to find a boiler to suit your home whatever your heating and hot water needs. This boiler is so compact in size it is able to be installed in a standard sized cupboard with ease. making the unit perfect for those homes where space is limited. This boiler is a high quality boiler with a high efficiency modulating Grundfos pump which will continuously adapt to your heating and hot water demand, helping to reduce your energy bills. This boiler comes with a rear flue option which gives you real flexibility as to where it can be placed in your home. A 7 year warranty is included as standard to give you peace of mind that you are getting a boiler that will not let you down.